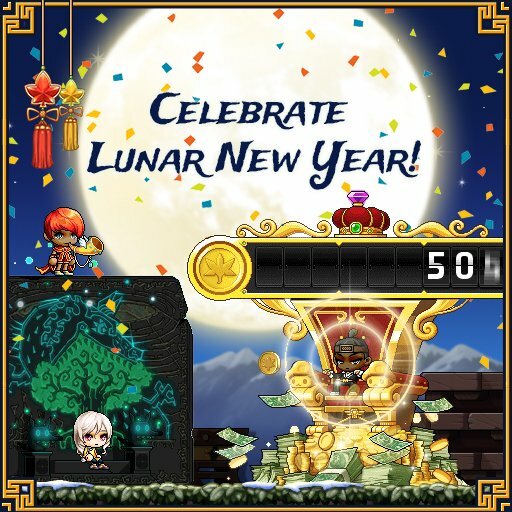 In order to celebrate the Lunar New Year, the MapleStory site prepares lots of fun events for our players. There are many things we can do, making fireworks, visiting the coin shop, and playing mini-games with others, and so on. Wish everyone a happy new year! To begin, accept the quest ‘[New Year's] How to Do New Year's Greetings’ from the New Year's Greetings notifier on the left side of the screen. Right-click another character and select “Send Greeting” to exchange greetings. If the other player accepts, a window will appear, and you can wish each other well. You can only initiate a greeting with 10 players per day, and you may only greet each account once. The daily quests reset at 4:00 PM (Pacific) each day. After successfully exchanging greetings, you will earn Family Points! 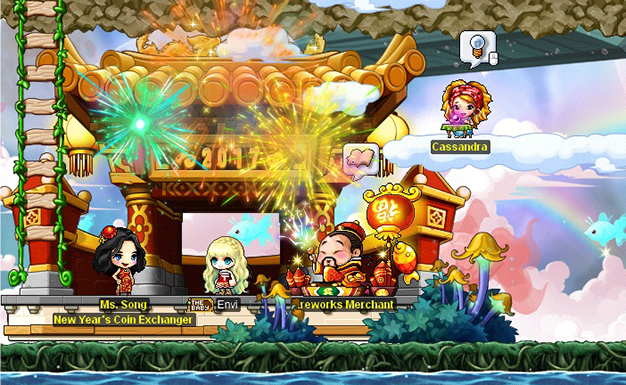 Each character also receives a family label, based on when the Nexon account was created. The older your account, the more aged your family label! If you exchange greetings with someone who has a different family label, you can earn more points. To earn New Year Coins and even a Moon Bunny Damage you need to keep collecting those Family Points. Skin if you reach 10,000 Family Points! This event starts and ends at midnight UTC, too. Celebrate the new year with a box of gifts! Hunt monsters within your level range (10 levels below and 20 levels above) and one may drop a special Chinese New Year Gift Box. Open the box to receive one random item guaranteed to start the year off right. The box contains such goodies as New Year Coins (for use in the New Year Coin Shop—more about that below! ), restorative items, trait items, and Spell Traces! It’s fun to ring in the new year with fireworks! Accept the quest ‘Make New Year Fireworks Materials’ to begin by crafting a Mysterious Flame Orb. Collect Firework Shells and Mysterious Flame Orbs and bring them to the Fireworks Merchant NPC (located in major towns) to create fireworks. 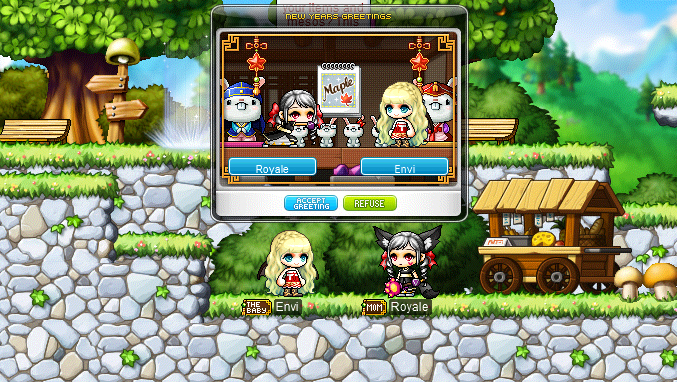 You can find Firework Shells inside the Chinese New Year Gift Box, or from defeating Maple Fireworks monsters that appear in fields during the event period. You can make fireworks ten times per day. The Fireworks Merchant NPC will help you randomly create one of three kinds of fireworks--Normal Fireworks Box, Floral Fireworks Box, or New Year's Blessings Fireworks Box. Double-click the box to see it explode and give you one random item! Blow up your boxes to find items such as New Year Coins, restorative items, trait items, a Blessed Bugle face accessory, or a Firework Chair! Notably, this event starts and ends at midnight UTC. Celebrate the new year with a game of Bingo! Characters Lv.33 and above can begin by accepting the invitation that appears over your character’s head at the top of every hour between 12:00 AM and 2:59 PM (Pacific). You will be moved to the event map along with many other players! When NPC Kemdi calls a number, check your Bingo board to see if you have that number. If you do, click the board to mark it. Once you complete a line, click the “Bingo” button and you’ll be added to the Bingo ranking on the right side of the event map. You can play in three games each time you join the event. Once the game ends, everyone will receive New Year Coins! The higher your rank, the more coins you’ll receive. You can participate up to three times (three games each time) per day. You’ve been collecting those New Year Coins—now take them to the New Year Coin Shop to exchange them for wonderful items! Visit Miss Song to see what she has stocked in the shop. Collect items such as a Special Medal of Honor, Selective 4 Slot Coupon, Blessed Bugle scrolls, Mastery Books, potential items, and more! You can also get one of three new chairs—the Abraxas Chair, Subsumed World Tree Chair, or Ostentation Chair. The Ostentation Chair is unique in that it consumes mesos as you sit on it! Show the world how flush you are as you zoom through your meso supply. Join other players in a game of OX Quiz! Characters Lv.33 and above can begin by accepting the invitation that appears over your character’s head at 30 minutes after the hour between 12:00 AM and 2:59 PM (Pacific). You will be moved to the event map along with many other players! NPC Kemdi will read a question, and you have to answer yes or no by moving to the “O” zone (for yes) or the “X” zone (for no). The game ends after Kemdi reads all 20 questions! If you get a question wrong, you will be moved to the zone at the bottom of the map, where you can watch the rest of the round. You can play in three games each time you join the event. Once the game ends, you will receive an amount of New Year Coins based on how many questions you answered correctly. You can participate up to three times (three games each time) per day. It's also worth it to note that all these events are available from Wednesday, January 18 to Tuesday, February 7. It's quite a long time for players to get items they want.